HARRISBURG, May 7 – State Rep. Joseph Petrarca, D-Westmoreland/Armstrong/Indiana, reminded veterans that the Persian Gulf Bonus Program is due to expire this summer. To qualify for the bonus, veterans must have served on active duty in the first Persian Gulf War, known as Desert Shield and Desert Storm. The deadline to apply is Aug. 31. "This is a program I co-sponsored and voted for back in 2006 because I believed it was important to recognize those military men and women who sacrificed for us," Petrarca said. "Until then, Pennsylvania hadn't had a war bonus program to recognize those serving in operations Desert Shield and Desert Storm. Now the program is coming to a close and I want to make sure everyone who qualifies knows about this program and applies." The program pays $75 per month for qualifying, active-duty service members, up to a $525 maximum. For those whose death was related to illness or injury received in the line of duty in the operations, an additional $5,000 is available to the surviving family. Service members who were declared prisoners of war also may be eligible for an additional $5,000. Petrarca also said that Pennsylvania’s Department of Military and Veterans Affairs is asking veterans who might have previously been denied the bonus to reapply. New applications are required to reopen a claim. Been a legal resident of Pennsylvania at the time of active-duty service. For detailed instructions on how to apply, please visit www.persiangulfbonus.state.pa.us. 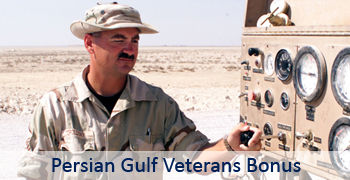 So far, more than 11,000 Persian Gulf veterans have applied for the bonus program since its start in 2008.